Some people have said they feel our courses are expensive but if you look at the examples below we hope you will agree we are actually great value for what is QUALITY tuition and service. Lets look at our longest course and compare it with hourly lessons. Quality hourly lessons usually cost between £29 and £35 and a 40 hour intensive is equivalent to 45 to 50 hourly lessons in achievement if not more! So 45 times £29 works out to be £1305, then add the cost of your practical test which is £62 and we have a total of £1367. That means that just taking the lowest price into consideration we are nearly £200 cheaper at £1169 without accommodation and just £118 dearer if we include our great accommodation for the 7 nights! Check out our prices now! Remember too that is not just about prices, with intensive courses you will have just practiced the area you are likely to go on your test rather than possibly 5 or 6 weeks previous giving you a better chance of passing which is why it has a higher pass rate than our hourly lessons! It usually pays to shop around but it is very important that you check what is included in the price! We feel it is wrong to quote a price and then you have to add the ‘extras’ in so ALL our courses include one-to-one tuition and the practical test fee. Our residential courses also include great bed & breakfast accommodation too! You also need to be clear on what you are getting for your money, we had a quick look and quote one website who advertise a 42 hour course for £699 it is shared tuition so in real terms it is actually just 21 hours behind the wheel for £699. Our clear pricing and one-to-one tuition means a 20 hour course from us translates to 20 hours behind the wheel for only £669, and that is without having to spend another 21 hours sitting in the back! Another company high on the Google search quotes the price for a 25 hour course at £971. It turns out that it is does not include accommodation so we are a staggering £176 cheaper or just £4 dearer if you include the accommodation! We pride ourselves on the quality of our tuition so I feel sure their tuition will not be any better than ours! Another company states you receive a free retest should you fail, they are £171 dearer and the test is only £62! A company local to us quotes £1429 for a 40 hour automatic course and includes both a theory and practical test, we may not include a theory test but we are £220 cheaper but a theory test costs just £23 so that is a £197 saving! What about a guaranteed pass? No-one can actually guarantee you a pass but they offer ‘free’ training if you fail, sounds great but most are over £800 more than us! The nearest one we have found is £431 dearer and that is not even intensive, it would pay for a lot more lessons! Having said all this the most important thing is the quality of tuition that you are going to receive which is so difficult to judge through a website. 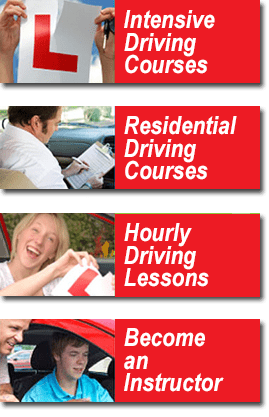 We are one of the most recommended intensive driving course company’s in the UK and have been voted ‘Best Residential Driving Course Provider 2018 – UK’ and that is on top of being voted ‘Driving School of the Year – London’ we have only got there by being very good at what we do! Don’t just take our word for it check out our reviews, remember it is so important to make the right choice as you only want to do this once! Be warned, we have heard so many complaints about some companies doing underhand things like not even booking a test for you then telling you on the last day that you are not up to test standard so they will not allow you to take the test and pocket your test fee! We always arrange everything for you and give you chance to check the arrangements (not possible for short notice tests) before asking for any payment.